I learned to crochet before I knit. Luckily, though, my grandmother made sure I was introduced to both knitting and crocheting while I was still young enough to learn to enjoy both. So I can't say I have a preference for one or the other. That's why you are getting free instructions for both crocheted scarves and knitted scarves. In fact, I've made both knit and crochet versions of quite a few stitch patterns. This knit pattern, "Dreamweaver", is a good example. There's been a bit of a struggle, however, deciding the order that I'll release projects. Do I present the knitted version one day and the crocheted interpretation the next? Or put one out there and give the date that the other will be released? What do you think? Click here for the "Dreamweaver" pattern instructions. 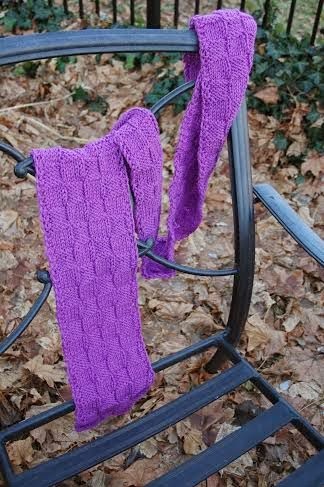 Sad to say I missed out on Dreamweaver Scarf pattern as a freebie, but I will be checking each day. Please note on Ravelry site Dreamweaver you have listed as FREE, but can only be obtained through buying now...you might want to go back and change that each day too. You do beautiful work, thank you for sharing your patterns and expertise.